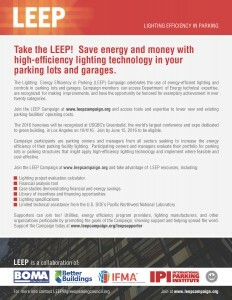 The Lighting Energy Efficiency in Parking (LEEP) Campaign is a program offering free guidance and recognition to facility owners and managers interested in implementing energy-efficient lighting solutions in their parking lots and structures. Phase 2 awards submissions are due June 15, 2016. Awardees will be recognized at GreenBuild this coming October. Learn more about the LEEP Campaign and take the LEEP to greater savings and efficiency here. Learn more about the awards process here.